They're calling Bill English the Double Dipper from Dipton. No one really knows why. But the name has stuck and so has the pizza he made a few weeks back. There are lots of things going on in the world at the moment but for some reason, New Zealanders can't get past that pizza. On the surface The Double Dipper of Dipton chiming in with a humanising social media pizza was smart. But some thought the surface of his pizza was too sloppy. It certainly raised some questions. My whole life I have wondered, what Italians with their fine culinary history think of our canned spaghetti. It makes sense to us but it must seem weird to Italians. What about when we put a can of it on a pizza or on toast? Pasta & Cuore is a restaurant and pastificio (artisan shop) in Mt Eden Village. It specialises in handmade Italian fresh pasta using quality ingredients and traditional methods. Their ethos is ''handmade, heart made'' and their food is amazing. Stefania is from Bologna, Italy and has been making fresh pasta all her life as a family tradition and in the restaurant trade. She owned her own restaurant in Italy but now lives in New Zealand. John is a Kiwi with a passion for Italian culture and Italian cuisine. I asked them how they feel about cans of spaghetti and our use of them on pizza. ''We live in a free society where people can choose to eat whatever they want, but it makes us sad to hear people say this is 'spaghetti'. 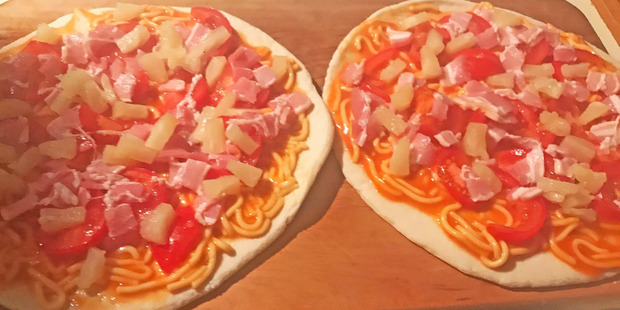 "It is not and when you put a can of spaghetti on a pizza what you end up with is neither pizza nor spaghetti. To an Italian the thought of this is like the sound of fingernails running down the blackboard." A second question hangs in the air. Do Hawaiians consider Hawaiian pizza Hawaiian fare? To answer that question, for you, I travelled to Hawaii. I am writing this article beachside at the Moana Surf Rider Hotel Waikiki. Just now I asked a local about Hawaiian pizza. I said: ''Pineapple is indigenous to South America, it just grows well here in the tropics." I asked for a quintessential Hawaiian drink and he made me a pina colada, which is, of course, Spanish for strained pineapple. Ironically the best pina coladas in the world are not served in Spain or Hawaii but at Pequeno, a bar down an alleyway off Moray Place in Dunedin. If you want to try really great Italian food visit Pasta & Cuore in Mt Eden, you won't regret it. However, many Kiwi parents will be rushing around making Double Dipper from Dipton-type dishes these school holidays. Often on toast. The mother of my children calls those ''spaghetti specials". The kids love them, probably because they have been told they are special. As Sky Sports Commentator Scotty J Stevenson put it in the pre-match coverage of the Blues v Highlanders at Forsyth Barr Stadium last week: ''Ham, spaghetti and pineapple are fine but it's not a pizza until you got cheese on it." Which was actually great rugby analysis. Will Bill's social media pizza help come election time? Will he lose the Italian vote? Does it play into the hands of Winston Peters? Did I need to travel to Hawaii for this article? Maybe not but in the end there's only one poll that counts and that happens in September.